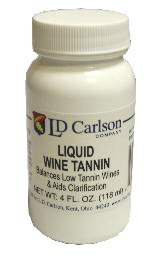 Liquid Wine Tannin adds a textural, earthy element that makes wine taste dry which adds complexity and tartness to the flavor, activating a dull wine into a vibrant, flavorful treat. More so for red wine, tannin can be used with white wines that have not been exposed to oak. Use in conjunction with gelatin or isinglass for later fining as well.